The research of Lou Kondic has concentrated on modeling and numerical simulations of two groups of physical systems: a) two fluid flows with emphasis on the interfacial dynamics, as well as free surface flows, and b) dynamics of granular systems. His studies of supersonic dynamics of gas bubbles in liquids exposed to acoustic radiation involved analytical and computational modeling of the convective and radiative energy transfer between fluids, and were applied predominantly to the effect of single bubble sonoluminescence. His research in the field of granular materials consisted of developing analytical models, as well as molecular dynamics simulations of 2D and 3D granular systems, with emphasis on the collective effects. 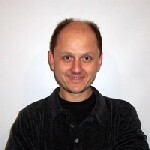 His work on the dynamics of thin liquid films involved performing large-scale computational simulations with the goal of understanding contact line instabilities and resulting pattern formation. Currently, he is involved in modeling and simulations of granular materials in a microgravity environment, and in the development of numerical methods for highly nonlinear partial differential equations related to the flows of thin liquid films. More Dr. Kondic’s biography can be found in the link below.